Saturday was a bottling day at my place. No brewing, just bottling. Was meant to be a quick one so we could get onto other things for the day. Chas came over and, unlike the last few days at my place, there wasn’t anything major getting in the way of starting. 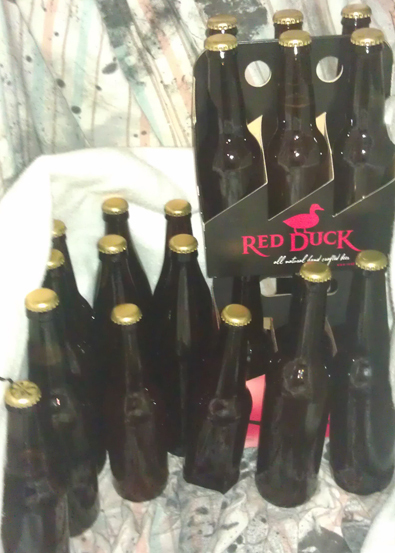 So we quickly got stuck into bottling the 13 odd litres of the Home Brewers R&D Vic Secret. Sannitising bottles is pretty easy with the tub and bottling tree. 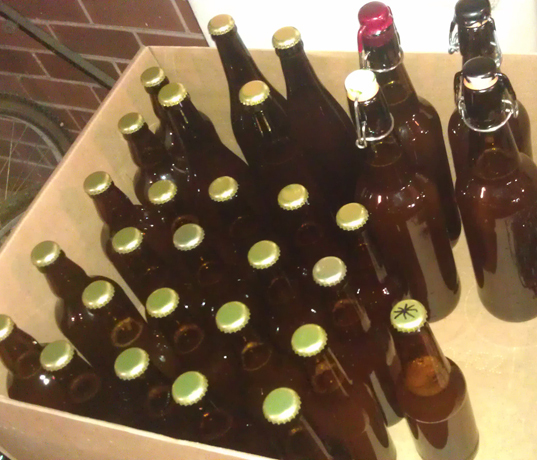 Went with a mix of a few bigger 500 ml bottles and a fair few 330 ml bottles. Bulk primed the beer was a simple affair. Did it in the big stock pot just like the Super Stout. But unlike the Super Stout we didn’t pour the thing into something else to bottle. We simply siphoned the beer into bottles. Done. 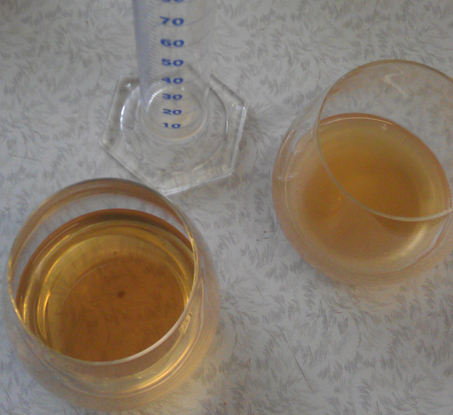 Before priming and bottling we did a gravity sample. Final gravity came in at 1.010 which means after conditioning it will be 3.4% alcohol. Not surprised as there was such a low original gravity. From tasting the gravity sample it was very hoppy and very bitter. Not sure how it will finish. I’m hoping this becomes a session beer and, if I can keep myself from drinking it all, something for the warmer months later in the year. Before calling it a day I decided to take a gravity sample of the Pseudo Lager. Was very surprised to see it down to 1.006! I’ve been hoping it would get down to 1.005 but expected it to finish around 1.020-1.010. That’s a good result and means the beer will be 6.0% after bottling. It tasted pretty alright as well, quite dry and not a lot of hops. Should be good once it is carbonated. Chas wasn’t that excited about bottling another 16 litres of beer. But after a bit of negotiation, and a break for a bit, we got into it. Rather than bulk prime into the pot, we used the recently emptied fermentation vessel with the tap and a brew wand. Saved a lot of time and finished quickly. A day of bottling. Normally nothing special, but a pleasant surprise with the Pseudo Lager. Looking forward to tasting and letting you know how it all worked out.